A new innovation, saves single use plastic pots, and allows roots to breathe. Supplied as 3 trays pre-filled with 36 x 8cm diameter bio pots - top up packs available. A new innovation, the Skelly Pot and Tray - the greener way to garden. We're really excited to bring you an eco-friendly potting revolution - the new, fully reusable and recyclable 'Skelly Tray' and Jiffy Bio Pots. 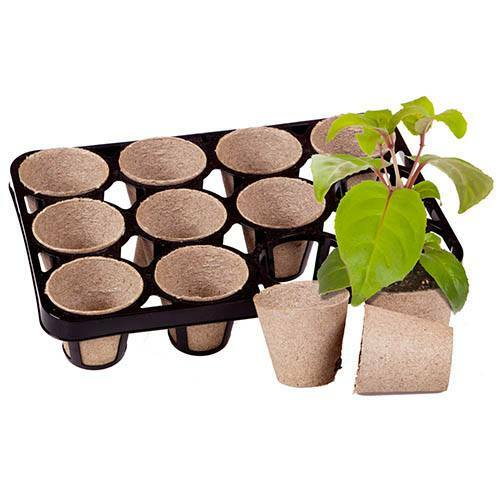 Effectively improving the quality and efficiency of plant growth, this pot carrier enables the bio pots to become an attractive, cost effective and eco-friendly alternative to plastic pots - helping to reduce landfill and working towards the overall amount of plastic polluting the environment. The unique 'skeleton' design exposes the bio pots to the air, which 'prunes' the roots, giving more compact plants. The bio pots allow any plants to be grown in them for 3-4 months and the whole bio pot can go straight into the ground for zero transplant delay - pots then degrade naturally in the soil after planting. Eco-pots have always been the favourite choice for gardeners keen to help the environment, as they ensure even watering and can be planted pot and all. Used in conjunction with bio pots, the Skelly Tray allows to effectively group a number of pots together, improving air circulation and therefore decrease disease and increase growth. Supplied as 3 Skelly trays, plus Jiffy Bio pots for 36 plants.